WEATHER OR "NOT WEATHER" ..... That Is the Question! 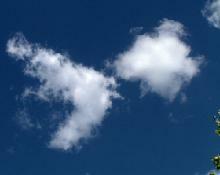 Another Question is This: " Is our Weather Being Manipulated ? " If so .... Where is the Proof ? ..... Could This be It? Our Sun hits the Earth with 170 Billion Megawatts of Ultraviolet Rays, X-Rays and other types of radiation. They all collide together and then interact with the atoms in Earth's atmosphere (oxygen & nitrogen, etc.). When the radiation hits those atoms, it breaks some of the electrons away and they float up as positively charged "ions" .... hence the phrase: "The Ionosphere". But during the daytime; these Ions are just drifting around up there with no negatively charged electrons to interact with (as finding electrons to hook up with takes hours) and so the Earth has these "roving bands of positively charged ions" at the 50 to 500 miles above the Earth range (between the weather balloons range and the satellites range). So, what are they good for; these bands of the "Ionosphere"? Well, Marconi found out you could bounce radio signals off of it and send a message across the Atlantic. That's a good thing. If you send radio waves off into space, then the Ionosphere can reflect them back down to Earth so you don't lose them ... so you can pick them up again all away across the globe. The Pentagon's Research Department (DARPA) is interested because at certain points on the Earth; the Ionosphere intersects with the Earth's Magnetic field. If you heat up the Ionosphere at the right time in the right way (with high frequency radio waves ) you can get the electrons moving. They detach from nuclei & become "free agents" . This condition opens up all sorts of scientific applications ... both defensive, offensive, and informative ... good, bad, & ugly. Secretary of Defense under Bill Clinton ... William Cohen ... suggested that "electromagnetic waves could alter the climate and even remote control earthquakes and volcanoes. 180 Silver Poles a Foot thick and 72 Feet tall; spaced exactly 80 feet apart; & topped off with 4 rods. The Poles are connected to the Earth, each other, & the ground by metal and Kevlar wires. Topping everything is a wire frame hung across the top, & 15 Feet above the ground. This construction is all calibrated to the millimeter across 30 Acres. It can hit the sky with up to 3.6 megawatts of anything from DC current to visible light across 15 orders of magnitude on the electromagnetic spectrum. 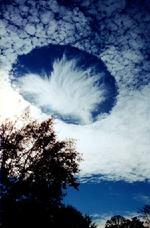 Its range may be about 1,000 kilometres and it may be possible to mount HAARP on moveable platforms. 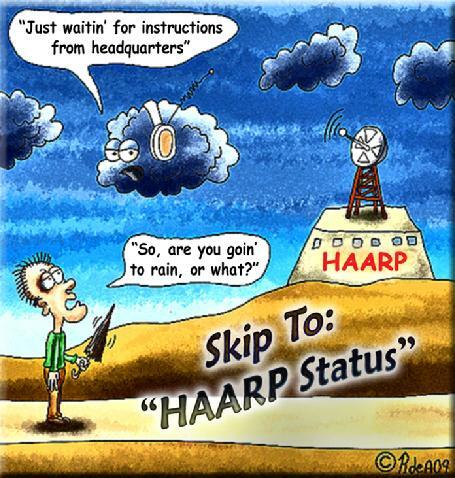 HAARP's funding runs into the hundreds of millions. 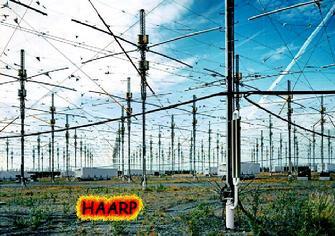 HAARP is in Alaska about 200+ miles northeast of Anchorage. There is a control and power center housing FIVE 3600 horsepower diesel-electric generators (according to Noah Shachtman of Wired Magazine... he knows because he's been there). Along the road, every few hundred yards, are 150 foot areas that contain instruments. There are 4 gold crosses to measure ionospheric absorption, a telescope dome and a grouping of poles which are said to keep an eye on the ionosphere and another wire and fiberglass construction further on. What Can Dissolve a Hurricane? BUT: Do You Remember Ophelia or Wilma? It shows the model of a Hurricane Image taken from 5 low-earth orbit satellite instruments. It is the Microwave signal of the Hurricane . All the data is then animated so we can see the Hurricane in a completed cycle. Normally the satellite makes passes only every 4-5 hours. That's why you wait for the next "update" to see where a Hurricane is going. But MIMIC gives it to you in "image frames", all at once. And, the microwave signal can see through all the cloud tops, etc...to the actual convection development going on. What is amazing about this image of Hurricane Ophelia? Also being shown is Hurricane Ophelia being affected by red rays or beams...not an anomaly...they are actually there... and actually seem to dissolve the Hurricane. Is this why there has been no other Gulf Coast landfall of a huge Hurricane since Katrina & Rita? At least not until Gustav & Ike ... both of which did miss New Orleans. But Gustav did worse damage to Baton Rouge and Ike almost destroyed Galveston. How ( or why) did they "get through? Katrina hit New Orleans on August 26th, 2005. In September and October of 2005, could Ophelia & Wilma have followed? Since Richard Hoagland has started calling attention to the "red beams", the University of Wisconsin has added a DISCLAIMER to all its posted MIMIC Imagery. They maintain that these "red beams" are only "imaging anomalies" . 2nd Note: There are also what might be called "red ropes"... not oscillating red beams; which also appear once or twice at the edge of the oncoming outer bands of some of the hurricanes. Again, not on all storms, but; these are different in appearance and may or may not be anomalies. Ever Wonder What Exactly Is In Those Chemtrails? Chemtrail content seems to act as a "dessicant" in the atmosphere. It suspends the moisture in such a way that the moisture doesn't make it to the ground... so it "dries out the atmosphere"...and ...heats it up. CHEMTRAILS: "Cobwebs Spun Back & Forth In the Sky"? Hopi Elders were invited to address the United Nations in New York City. "We must act swiftly to save land and lives. We were warned long ago that this time would come!" 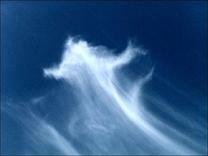 "...cobwebs spun back and forth in the sky"
NOTE: Chemtrails are believed by many to be harmful to one's health. However, some sources, which may or may not be accurate, maintain that governments know this, but; consider it worth the risk... either to protect the Earth from worse outcomes ... or .... they just don't care. For Example: Aluminium can affect Alzheimer's and what about the sudden increase in autistic children to one in every 150? Could there be a connection? What about diseases such as Morgellon's? There is a biological component in some chemtrails and some researchers believe there is a connection. Physical ailments? : Masses of cobweb-like material falls from some chemtrail spraying .... a white dust in others and a black granular dust in still others. Some people have allergic reactions while others experience nausea or breathing problems. Some notice skin problems or fungal problems. Some people notice nothing at all. But; whatever IS going on up there is happening all over the globe.Whatever's up there ... how is it affecting Earth and the Life on it? How might it be affecting us ? How might it be affecting you ? 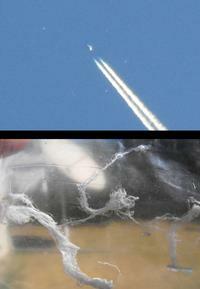 This is the web (photo on the left) that fell from the sky on 09/27/10 . It is a man-made, nano-structure, full of Morgellons fibers. The photo on the right shows a piece of Nebraska chem web sample cultured differently than the first. You can see the fibers gradually growing and emerging. These are all nano-sized and not visible to the human eye. This was taken on Sept 27/10 in McCook, NE. This thing was spraying chemtrails and stuff was falling out of the sky that looked like spider web but it was light and strong and now are waiting for the test on it. People need to be aware that in 1982 a patent was registered that could change cloud precipitation using DMSO. DMSO is a carrier which allows any substance which follows to enter the human cell. This is the reason some people with Morgellons have insect parts in their bodies. If an insect bites or even lands on a person who has recently been in contact with DMSO, then some DNA of that insect will enter the cellular structure and mutate. WHO'S WARRING WITH WHOM ? WHOSE SIDE ARE "WE " ON ? Note: Scalar waves = A volume of "Charge Density" ... mass + length. There are sound waves, light waves, water waves, etc., but; Scalar Waves here would probably be either Gravity or Electromagnetic Waves. This is relevant in the sense that Science discovered; one of the "useful" aspects of the Earth's Ionosphere, is it's being full of plasma & positively charged ions. So, if "they" hit it (or heat it up) with Scalar Waves ... presumably electromagnetic; who knows what all they might be up to? "what is going on up there"? is well worth a look and a read. 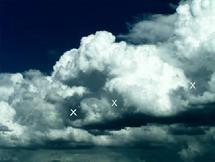 Scalar Weather Wars between countries or individual or even "races" unknown. Radiation from parts unknown so life threatening to earth that they must be "mitigated". Shielding from a Sun emitting too much radiation of its own. An Early Warning "Alert" System & Energy Barrier from parties "unknown". "Elite Uber-World Manipulators" ... "duking it out" to affect each other's commodities markets or blackmail countries . Do You Remember "Different Skies"? 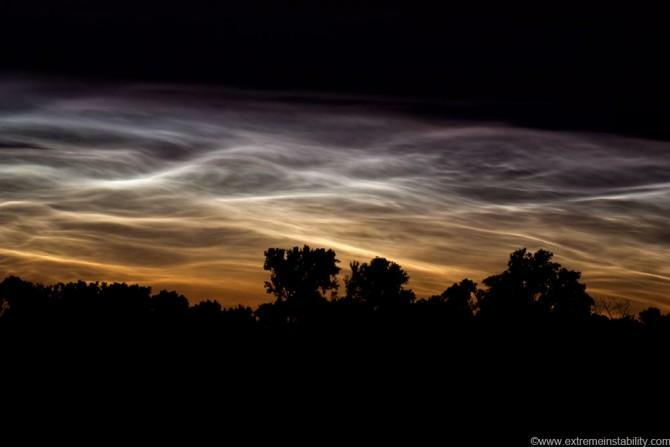 Noctilucent clouds are a new phenomenon in the mid-latitude skies. Also, over the past 25 years; they have become more numerous and are shining more brightly over the Polar Regions. Over places like Utah, the temperatures would have had to get 20� colder than usual. And, no .... neither C02 nor Methane would account for more than a degree or less. It showed up on LIDAR in Utah. But as yet; no one knows how or why. While "we" are all "snug in our beds" ... glowing Noctilucent Clouds ... previously seen almost exclusively around the North & South Poles are now showing up in the Skies over the United States and Eruope in the past several days. What Gives? Omaha, Seattle, Paris, France: Noctilucent Clouds are clouds full of ice crystals floating 50 miles up at the point where Space and Earth's atmosphere meet. The sunlight which still reaches them due to the curvature of the Earth, catches the ice and "lights up the clouds". 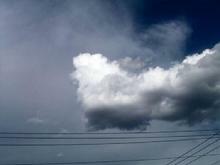 These "Glory Clouds" are new as well. 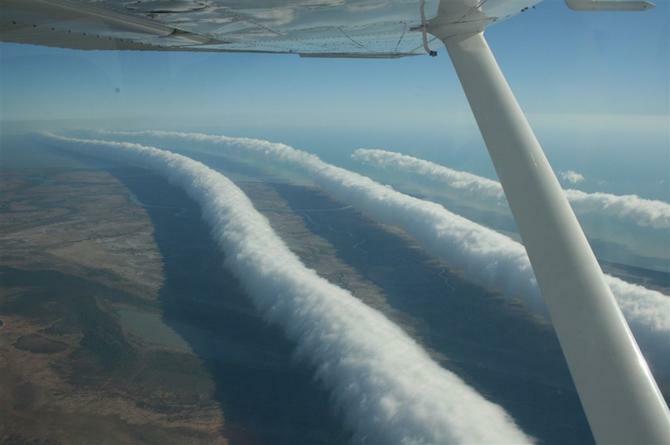 These are being spotted over Australia but no cause is yet known. They run for as much as 600 miles in length and look like a narrow roll of paper towels or a rolled up carpet, or long wooly pipes. New Skies, indeed.